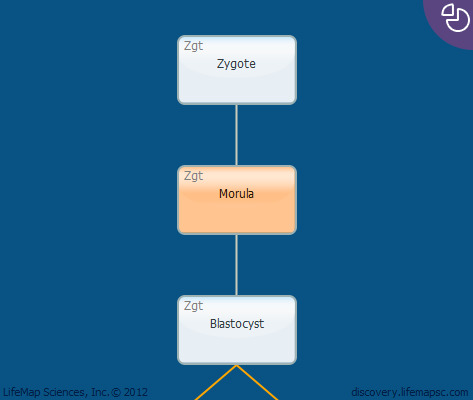 The morula is a globular solid mass of 16-32 blastomeres formed by cleavage of the zygote that precedes the blastocyst. A process named compaction begins at the 8-cell stage, wherein the round and loosely connected blastomeres assume a flattened polarized cell morphology. The outer cell surface becomes convex and the inner surface becomes concave, due to differential adherence patterns of the inner and outer cell surfaces. Compaction results in an inner and outer layer of cells. This is the first time in the developing embryo, when a distinction can be made between different cells. The inner layer will ultimately form the inner cell mass, while the outer layer will form the polarized trophoblast. On day 4, the morula usually consists of about 30 cells and begins the transition to the blastocyst, which occurs as an inner fluid-filled cavity is formed within the morula. The presence of the cavity, called the blastocoele, marks the beginning of the blastocyst stage. Between days 3-4 of development, the human embryo reaches the uterus. While mouse blastocysts implant at approximately E4–4.5, human embryos undergo at least one additional cell division and implant between 6-8 dpc.